What is it about the Narendra Modi app (NM app) that has made it the most downloaded political app in the world? Is it that it directly connects you with Prime Minister Narendra Modi? Or is it that it empowers you with the latest information, curated to suit your interests and needs? Or is it simply that the app is one of the most technologically savvy apps in its genre? Well, it is all this more. But first, let's understand these points in greater detail. Direct connect with Prime Minister: Think of a Prime Minister whose work ethic has become an international inspiration. Or think of a Prime Minister whose overarching vision for Transforming India has not only got international acclaim but has already started showing results on the ground - to list just two achievements : India is now the fastest growing major economy in the world, ahead of even China, and in 2016 India has become the highest FDI destination, again ahead of China and even USA. Now imagine you being in direct connect with this Prime Minister ! Yes, this is the power the NM app gives you. No wonder then that with over 3.3 million users, the Narendra Modi App is the most downloaded and used App of any world leader. This is an app the Prime Minister Modi follows himself, not just once but many times daily. To keep track of what people are saying or thinking. To get a pulse of the nation. To get ideas from people which can contribute to India story. To seek suggestions on policy issues. And many times the Prime Minister himself responds to a person whose idea or comment he likes. The app gives one the power to associate with many of the Prime Minister's initiatives - like volunteering for Swachh Bharat or associating with Digital India or MyGov. To list just few examples: Lakhs of citizens sent their birthday wishes to Prime Minister Modi via the Narendra Modi App in seconds. Thousands of people took Swachh Bharat pledge on 2nd October. 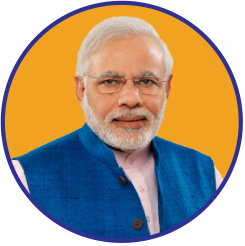 Over 3 lakh users sent their #Sandesh2Soldiers using the Narendra Modi App. And to top it all - the most innovative, the most consistent or someone with one bright idea - all of you can get to meet the Prime Minister in person. This has happened many times in the past. You could be the next ! Stay Updated: We vote once every five years, but what happens in between? Should not the government report on a regular basis on what it is doing and what is the progress on the promises it made? Well, not just the government but the Prime Minister himself is reporting all this - not on a regular basis but daily ! Through info-graphics, charts, policy announcements, progress reports and much more. You do not have time to surf all the newspapers to cull out the stories on governance? No worries - the NM app does this for you. Every day. Every aspect of the governments programs and policies and the progress in them is available in real time. It is out there in the open - for you to follow, comment, critique, suggest changes, help you in your research or simply to keep you updated- the NM app will be your partner in whatever way you want ! In the words of Nagarajan R in his review on the Google Playstore: "So Great! So Proud!! I think no one PM has done before like this kind of idea to connect with people. It shows the transparency of this government under your supreme leader ship. Keep it up sir. We all with you. Go head sir." Technologically Savvy: What is the size of the popular apps you use? 50 MB or sometimes 80 MB or even more? Some of the popular games occupy as much space as up to 1 GB? So how much space does NM app take? Just 20 MB. Yes, the full feature NM app - that lets you listen to Mann ki Baat in 30 Indian languages, keeps you updated with high quality graphics and videos, lets you directly interact with the Prime Minister and lets you even build your own network - just takes 20 MB of your phone memory ! Yes, that is what the technological savvy of the app design is. Not only this, the NM App has been optimized to consume very low amount of data and battery. It will also function at low levels of internet speed. On the Google Playstore, out of 91,710 reviews, 77,162 are 5 star ratings while another 8,231 are 4 star ratings - the average of 4.7 making it one of the most highly rated apps. In the words of 'Joe Sujai - 'Good app Our PM Ji is one of the greatest person in the world.. He deserves many thing.. One of the fastest decision making capability person.. Apart from media this app contains lot.. This app very useful to follow our PM Ji.. 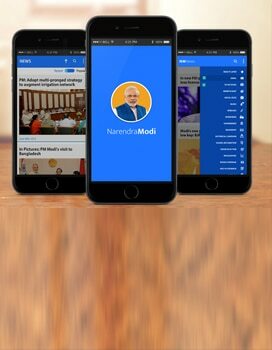 Hats off for those who creating this app... Jai hind.. ""
But apart from the above factors, there is one more reason why this is the app for you - you can get to know what the Prime Minister and his government is doing to better the lives of you and your children directly from him, without any intermediaries. Learn it first hand from him and give your feedback first hand to him - no intermediaries, no media, no officials, no red tape - it's just you and Prime Minister Narendra Modi in direct communication!